HP Umpire Tim Timmons ejected Diamondbacks Manager Chip Hale for either arguing a pending Replay Review decision which ultimately overturned 3B Umpire Chris Segal's foul ball (non-HR) call or continuing an argument from a previous inning (DiMuro Rule) in the top of the 2nd inning of the Diamondbacks-Rockies game. With none out and none on, Diamondbacks batter Jarrod Saltalamacchia hit a 0-1 slider from Rockies pitcher Yohan Flande on a fly ball to deep left field and into the stands, ruled a foul ball by Segal. During the ensuing Replay Review initiated by the Crew Chief, Timmons ejected Hale and the call was overturned to a home run, the call was irrecusable. At the time of the ejection, the game was tied, 0-0. The Diamondbacks ultimately won the contest, 6-4. This is Tim Timmons (95)'s second ejection of 2015. Tim Timmons now has 3 points in the UEFL Standings (1 Previous + 2 MLB + 0 Irrecusable Call = 3). Crew Chief Mike Everitt now has 5 points in Crew Division (-4 Previous + 1 Irrecusable Call = -3). This is the 187th ejection of the 2015 MLB Regular Season. 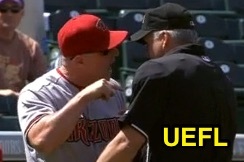 This is the 88th Manager ejection of 2015. This is the Diamondbacks' 4th ejection of 2015, 5th in the NL West (SD 15; LAD 8; COL, SF 5; ARI 4). This is Chip Hale's 2nd ejection of 2015, 1st since June 6 (Mark Ripperger; QOC = N [Balls/Strikes]). This is Tim Timmons' first ejection since June 23, 2015 (John Farrell; QOC = N [Balls/Strikes]).